Running on every production server at Facebook, asyncio is a proven framework that lets you work with concurrent code that is shorter to write, easier to read, more friendly to test, and often even faster to run. Lukasz Langa demystifies the core concepts behind asyncio, demonstrating how basic they really are. Lukasz uses actual asyncio source code to explain the event loop, blocking calls, coroutines, tasks, futures, thread pool executors and process pool executors, and yield from/async/await. Lukasz also explains how unit testing and debugging works in an asynchronous world. No prior asyncore, Twisted, or Node.js experience required. 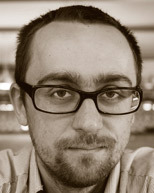 Lukasz Langa is a production engineer at Facebook. Lukasz has been a Python committer since 2010. He's also a chronic perfectionist, a pianist, and a dad. In his free time, Lukasz uses Python 3 to help Facebook maintain cache consistency.